Lightning Presenters at the OOIFB Town Hall Meeting. Photo by Leslie Smith. 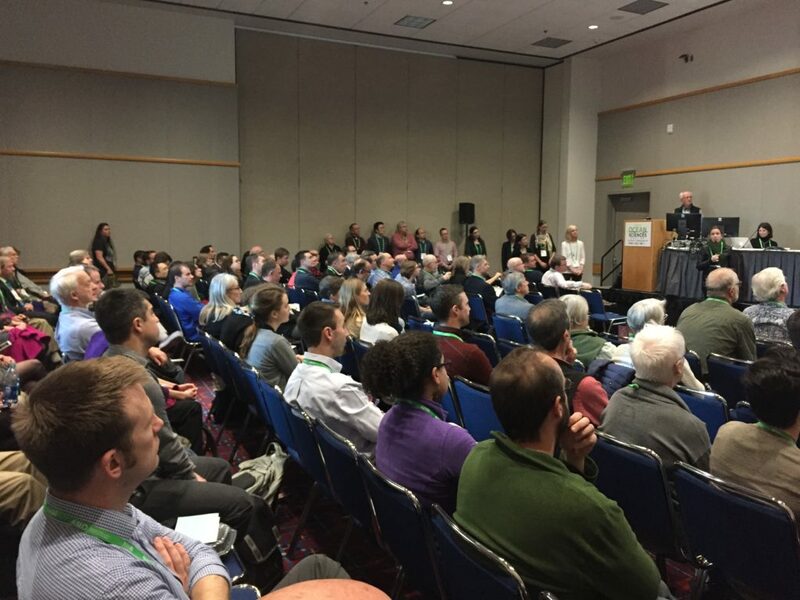 The National Science Foundation’s Ocean Observatories Initiative Facility Board (OOIFB) hosted a Town Hall on February 13th at the recent 2018 Ocean Sciences Meeting in Portland, OR. The room was overflowing with more than 80 members of the community attending the session as well as those joining via web conference. The OOIFB was created in 2017 to provide independent input and guidance regarding the management and operation of the National Science Foundation (NSF) funded Ocean Observatories Initiative (OOI). The OOI is now an operational ocean observing system with data available on the Internet free of charge. The goal of the Town Hall was to engage the researcher community to learn about their thoughts and recommendations on the OOI. It also provided the users an opportunity to hear updates on the latest status, data applications, and plans for OOI. Larry Atkinson, OOIFB Chair, welcomed the participants and introduced the OOIFB members in attendance. Lisa Clough (NSF) provided a brief update on the current status of the OOI. NSF anticipates an announcement of the new OOI operations team in May. Leslie Smith and Mike Crowley followed with the exciting announcement that a special issue of Oceanography focusing on the Ocean Observatories Initiative has hit the street. The issue can be freely downloaded from the TOS website – http://tos.org/oceanography/issue/volume-31-issue-01. They also announced that OOI is hosting several workshops for early-career scientists interested in learning more about the OOI and how to use data from the program in their work. The workshops focus on the development of programming, data analysis and evaluation skills. Overviews of the marine infrastructure and software tools maintained by the OOI will also be provided. For information about the workshops and how to apply, go to <http://oceanobservatories.org/data-workshops/>. The OOI is a large, complex ocean observing system with an enormous amount of data. One way to access the data is using ERDDAP. ERDDAP provides a simple, consistent way to download subsets of scientific data in common file formats and make graphs and maps. The OOIFB Town Hall featured a video developed by Rich Signell (USGS) and presented by John Kerfoot (Rutgers) that demonstrated the ERDDAP access technique for OOI data. All OOI data can be accessed at oceanobservatories.org. The Town Hall closed with a brief opportunity for discussion and questions. OOIFB thanks the members of the community for joining the Town Hall. If you would like to be added to the OOIFB community email list so that you can learn more about upcoming events, please contact office@unols.org.